Kick off your visit on the 1st (Wed): delve into the distant past at Group of Monuments at Hampi. For more things to do, maps, and other tourist information, go to the Hampi day trip planning app . New Delhi to Hampi is an approximately 7-hour flight. You can also do a combination of flight, taxi, and train; or drive. When traveling from New Delhi in May, plan for slightly colder days in Hampi, with highs around 40°C, while nights are about the same with lows around 30°C. Wrap up your sightseeing on the 2nd (Thu) to allow time to drive to Bengaluru. 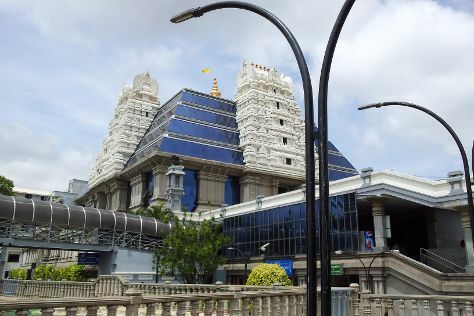 On the 3rd (Fri), explore and take pictures at M Chinnaswamy Stadium, take in the spiritual surroundings of St. Mark's Cathedral, take in nature's colorful creations at Lalbagh Botanical Garden, then don't miss a visit to Vidhana Soudha and Attara Kacheri, and finally contemplate in the serene atmosphere at ISKCON Temple Bangalore. For photos, ratings, where to stay, and tourist information, refer to the Bengaluru trip planner . Getting from Hampi to Bengaluru by car takes about 5 hours. Other options: do a combination of train, taxi, and flight; or take a train. Plan for little chillier nights when traveling from Hampi in May since evenings lows in Bengaluru dip to 26°C. Finish your sightseeing early on the 3rd (Fri) to allow enough time to drive to Kodagu (Coorg). Start off your visit on the 4th (Sat): admire the sheer force of Abbi Falls and then head outdoors with Mandalpatti. To find traveler tips, more things to do, where to stay, and tourist information, go to the Kodagu (Coorg) trip itinerary builder site . Drive from Bengaluru to Kodagu (Coorg) in 4 hours. Alternatively, you can do a combination of flight and taxi; or take a bus. Wrap up your sightseeing on the 4th (Sat) early enough to drive to Ooty (Udhagamandalam). On the 5th (Sun), look for gifts at Higginbotham's Bookstore, then pause for some serene contemplation at St. Stephen's Church, then explore the activities along Upper Bhavani Lake, and finally admire the natural beauty at Botanical Gardens. To find more things to do, where to stay, maps, and tourist information, refer to the Ooty (Udhagamandalam) road trip planner . You can drive from Kodagu (Coorg) to Ooty (Udhagamandalam) in 4 hours. Alternatively, you can take a bus. In May, daily temperatures in Ooty (Udhagamandalam) can reach 40°C, while at night they dip to 28°C. Wrap up your sightseeing on the 5th (Sun) early enough to drive to Kodaikanal. A cool and relaxing hill station, Kodaikanal has long attracted visitors up to its privileged position in the Western Ghats. On the 6th (Mon), contemplate in the serene atmosphere at Subrahmanya Temple (Kartikeya Temple), explore the striking landscape at Dolphin's Nose, then explore the ancient world of Dolmen Circle, then stop by The Cocoa Bean, and finally contemplate the waterfront views at Kodaikanal Lake. For maps, more things to do, other places to visit, and other tourist information, read Kodaikanal online trip planner . Traveling by car from Ooty (Udhagamandalam) to Kodaikanal takes 5.5 hours. Alternatively, you can do a combination of bus and taxi; or do a combination of bus, train, and taxi. In May in Kodaikanal, expect temperatures between 39°C during the day and 30°C at night. Finish your sightseeing early on the 6th (Mon) so you can travel to Pallivasal. Pallivasal is a village in Idukki district in the Indian state of Kerala. On the 7th (Tue), examine the collection at Tea Museum, see human ingenuity at work at Mattupetty Dam, and then admire the natural beauty at Tea Gardens. Keep things going the next day: take in the awesome beauty at Chokramudi Peak, then get into the urban bustle at Kalari Kshethra, then take in nature's colorful creations at Rose Gardens, and finally look for gifts at Tata Tea Outlet. To see more things to do, traveler tips, and tourist information, you can read our Pallivasal trip planner . Drive from Kodaikanal to Pallivasal in 5.5 hours. Finish your sightseeing early on the 8th (Wed) to allow enough time to travel to Alappuzha. Start off your visit on the 9th (Thu): take in the spiritual surroundings of Ambalapuzha Sree Krishna Temple, stroll through Alappuzha Beach, and then kick back and relax at Marari Beach. For reviews, photos, where to stay, and more tourist information, read our Alappuzha trip itinerary builder site . Traveling by car from Pallivasal to Alappuzha takes 5 hours. Expect a daytime high around 38°C in May, and nighttime lows around 30°C. Cap off your sightseeing on the 9th (Thu) early enough to go by car to Varkala. Start off your visit on the 10th (Fri): enjoy the sand and surf at Varkala Beach, relax and rejuvenate at some of the best spas, then contemplate in the serene atmosphere at Vishnu Temple, and finally take in the spiritual surroundings of Janardhana Swami Temple. To see where to stay, maps, traveler tips, and other tourist information, read our Varkala online trip builder . Traveling by car from Alappuzha to Varkala takes 2 hours. Alternatively, you can take a train; or take a bus. In May, daily temperatures in Varkala can reach 37°C, while at night they dip to 30°C. Wrap up your sightseeing on the 10th (Fri) to allow time to travel back home.